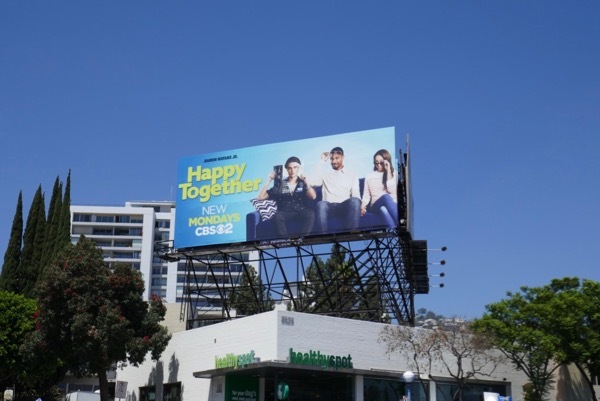 The sitcoms (and laughs hopefully) keep coming this fall TV season with the new CBS comedy, Happy Together. 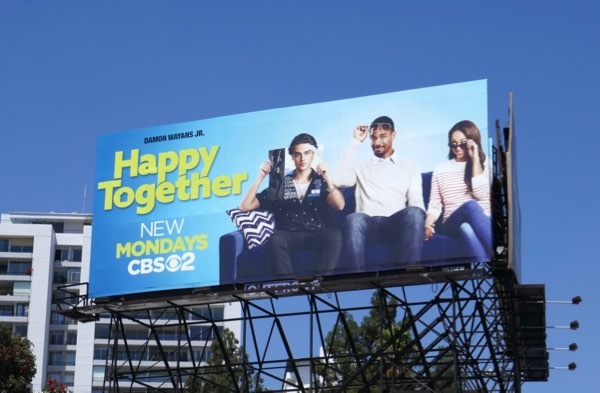 Happy Endings and New Girl's Damon Wayans Jr. stars as 'Jake' who is happily married to 'Claire' (Amber Stevens West) and whose homebody lifestyle is upended when a client of Jake's accounting firm, world famous pop star 'Cooper James' (played by Felix Mallard), decides to hide out at their house from the paparazzi for a few days. The married couple soon discover they can't keep up with the young music superstar's exciting lifestyle, but turns out he finds their down-to-earth way of life appealing. 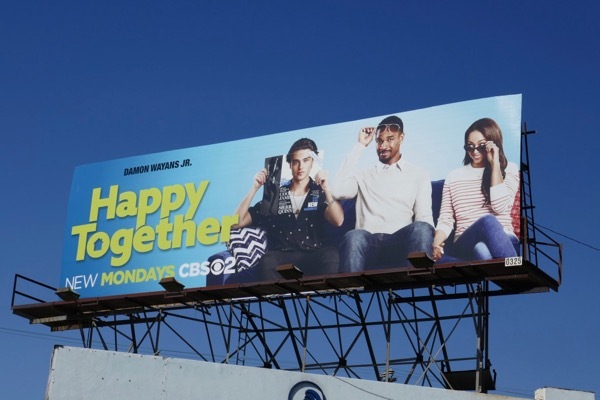 These billboards and wall mural for the sitcom were photographed along Melrose Avenue, Santa Monica Boulevard, Fairfax Avenue and Westwood Boulevard from August 15 to September 8, 2018. 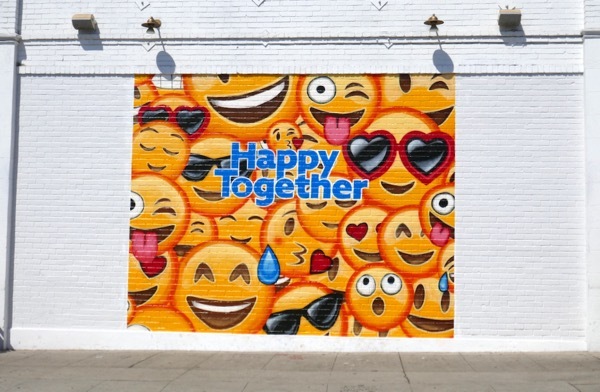 For similar outdoor ad creatives using this magazine cover technique over someone's face, make sure you check out these movie billboards for The Ides of March and these film billboards for A Futile and Stupid Gesture. 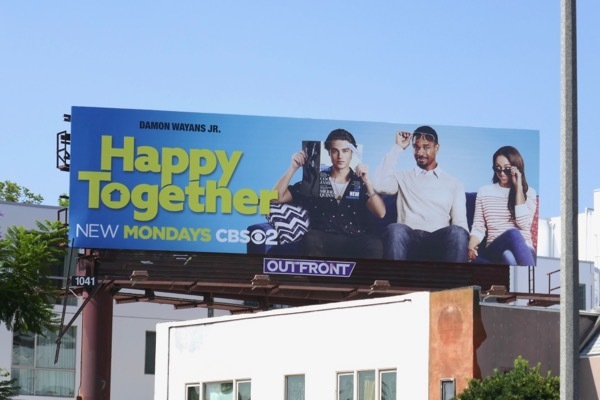 They say two's company, three's a crowd, so can three people be happy living together under one roof, you'll just have to watch and see.